The photo above shows the approximate location of the John Walker Donation Land Claim, which formed the basis for what became Laurelwood. I wish I had a satellite photo from 1900 for comparison, but I can’t find one. If such a satellite did exist, it would look much different. There would be no Laurelwood Academy, no Laurelwood Road, and just enough homes to house the extended Walker family. The Walkers were pretty much boxed in by the Chehalem Mountains, so their closest neighbors were Walter Hoffman to the south and Almoran and Sarah Hill to the west. The last house the Hills built still stands, on Spring Hill Road across from the end of Laurelwood. I don’t know where the Walker home was, but I think it’s safe to assume that it was between one and two miles away. Almoran Hill’s house also served as a station on the Forest Grove-Lafayette stagecoach line, so if the Walkers walked there they could catch a coach south Dewey, where Spring Hill meets Albertson and Laughlin roads, where they could transfer to the Laughlin Gap stage to Yamhill, McMinnville, or Tillamook. 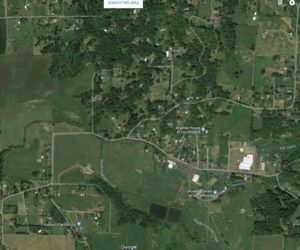 More likely they would head north, either all the way to Forest Grove or to catch the train near where Spring Hill crosses Highway 47. You might notice that I didn’t mention Gaston, which isn’t fair because they could take the train south into town. But because of the Chehalem Mountains, Wapato Lake, and the Tualatin River, there were few safe or easy connections between the Forest Grove-Lafayette stage line and the railroad, which paralleled the route Highway 47 now follows. In fact there were no year-round crossings between Yamhill and the what’s now the junction of Spring Hill and Highway 47. (Gaston Road wasn’t built until 1917 and washed out regularly in its early years). That made visits to Gaston by people east of Wapato Lake so rare that they often were covered by local newspapers. Most donation land claims were one square mile (a few were a half square mile), so a trip into Forest Grove to buy flour or shoes would have taken the Walkers past only about eight properties until they transferred onto the stage at where Highway 47 now crosses Elm Street to finish the last leg of their trip. But because of how infrequent the stagecoaches and trains ran, that 20-mile round trip often took two days, so they probably checked their shopping list carefully. I have not counted all the homes we pass today between Laurelwood and Elm Street in Forest Grove, but when you add up all of the side roads and streets, it’s probably into the hundreds, all on the same land that once had eight or 10 (although by 1900 some of the donation land claims had been divided, including to form the small town of Dilley). And the trip doesn’t take two days, even when you’re behind a tractor, which the Walkers probably would have loved to own. I picked 1900 as the starting date for this little stagecoach trip down Memory Lane for a reason, because that’s the approximate date that Laurelwood and the rest of Washington County started to grow. In Laurelwood, the growth began when the Walker family donated two-and-a-half acres to the Adventists for a school in 1904. There are no Census figures specifically for Laurelwood, but in 1900 all of Washington County had fewer than 15,000 residents. Today it has nearly 600,000. About half of that growth has occurred just since 1980. About a quarter of the growth has occurred since 2000. This entry was posted in Uncategorized on April 15, 2018 by admin.